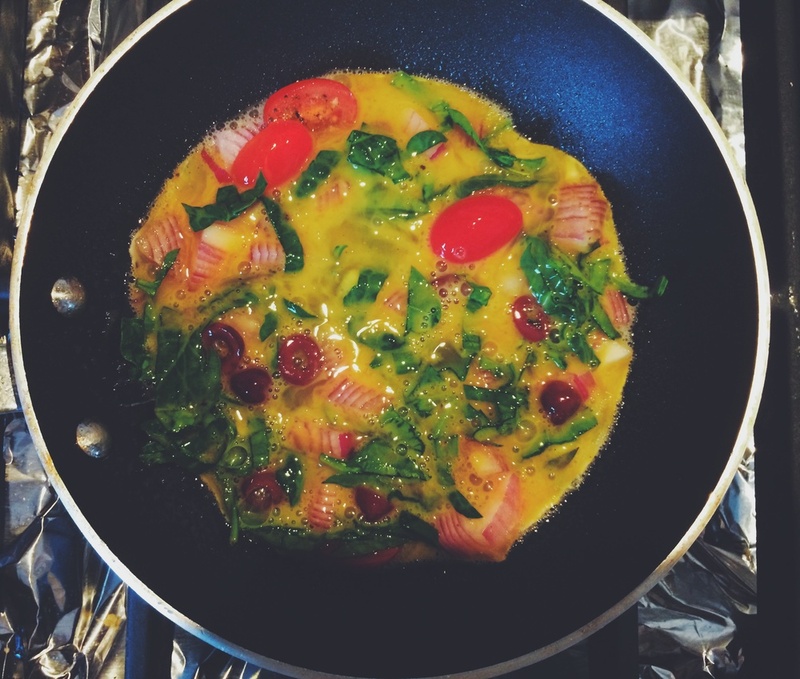 Omelettes are probably one of the easiest and quickest things to knock together. If you like to mix things up, try this flavor combination. Whether you're eating your omelette for breakfast, lunch, dinner, or even a quick snack, you'll find this Mediterranean blend of flavors hard to resist. Oo, just look at those colors. I've got my favorite olives, grape tomatoes, spinach, and red onions tucked in those fresh eggs. You could imagine the excitement when it came to flipping the eggs. Pillowed in some crumbled feta cheese. Yummmmm. I love some cheesy goodness. And last but not least, can't forget my favorite roast. Break the eggs into a bowl, and whisk with a fork. Season with the salt, black pepper, and paprika. Add the tomatoes, onions, olives, and spinach. Mix briefly. Heat 1/3 tablespoon of oil in the pan. Pour in the egg mixture and cook over medium-high heat for about 3 minutes, until the mixture from the sides to the center is half-cooked. Carefully flip the omelette and then top with the feta cheese, cooked side-up. Let cook for 2 minutes, until the cheese begins to melt. Slide onto plate and serve.